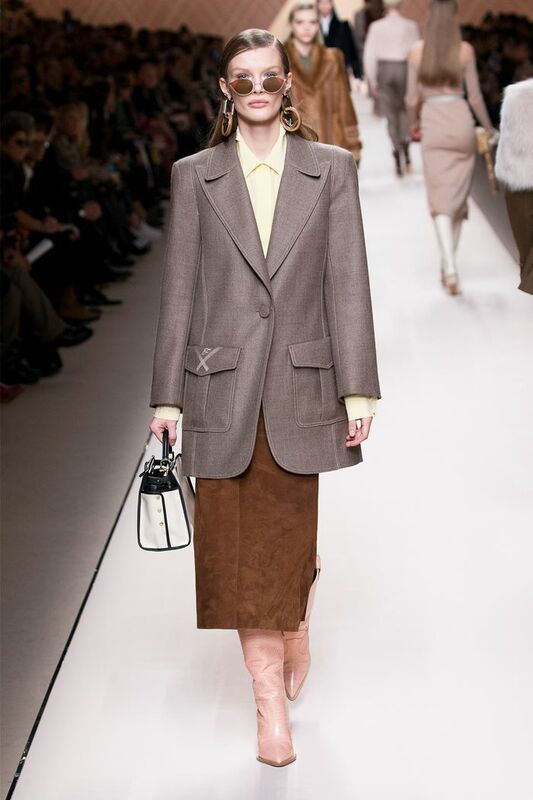 The show at Fendi, explained as “a romantic uniform in a woman’s world,” was just that: Wildly romantic with hints of glamour from another era like silky blouses and delicate neckerchiefs, it also included modern updates like sleek cowboy boots and fur sweatshirts that feel fresh and cool and bring it up to today. And with strong ’80s references—like shoulder pads and plaid boxy skirt suits—it’s clear that this collection was designed with powerful women in mind. While this entire show deserves your set of eyes, I’m boiling it down to four main takeaways. And, you better believe it includes the shoes every fashion girl will be coveting for next fall—this editor included. Sleek cowboy boots were dreamed up in styles from pink croc to gray plaid. And in this editor’s opinion, the Western nod is a genius way to remove the collection from the literalness of the '80s. As for styling them, they were worn with everything from tailored trousers tucked inside the boot itself to midi-length boho dresses and satin gowns. With casual trends like athleisure and denim commanding streetwear looks these days, Fendi offered something new: decidedly polished, confident outfits that look like they were plucked from film noir. Along with all of the glamour and power outfits and the rest, Fendi also threw in a fun collab—with Fila. Borrowing Fila’s iconic “F,” Fendi then re-appropriated it across its clothes and accessories. The limited-edition capsule collection will be available in August 2018.